Is your crochet fabric narrower at the bottom than it is at the top? When crocheting rows of sc, hdc, dc or any other stitch I ended up with the piece that wasn’t very square at the bottom and sort of had the corners missing. It was really bugging me. I couldn’t even make it any wider at the bottom by shaping/stretching it or blocking. I came to the conclusion that the top of the stitch is always wider and looser then the bottom of the stitch that is made directly on the foundation chain. That was causing another problem too. Sometimes I’ve measured the foundation chain and it was the size I wanted the fabric to be but when I started crocheting the stitches final crochet fabric was wider than what I anticipated. So the problem was in foundation chain, it was simply not as wide as it should be to match the top of the stitches! Simple solution to this problem – you have to make a looser chain. I’ve practiced this and the chain needs to be around 1/3 to 1/2 times bigger than you would normally do, basically it needs to be the same size as top of your stitches so the fabric is square and even. I’ve first tried just making chains bigger then I would normally do but they were all coming out a bit uneven so I came up with a different solution. I now use larger hook size to make a foundation chain then I use for making the stitches. In the example above I’ve used size J – 6mm hook for the foundation chain and for the stitches I’ve used size H – 5mm hook. This may be different for you as you may work with different tension that me. 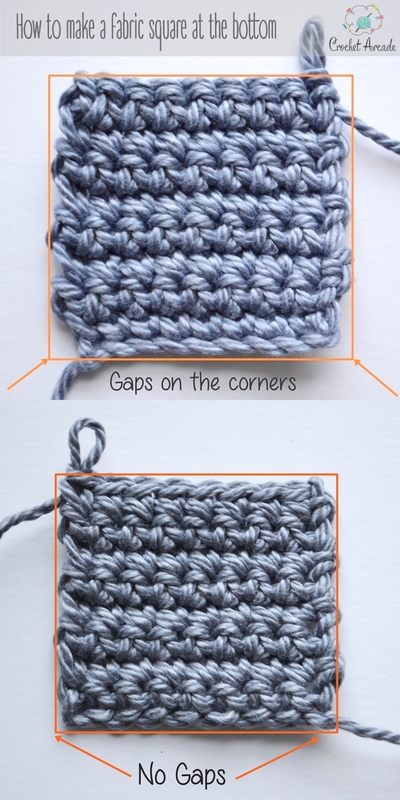 Try making a small swatch of 5-10 stitches and see if your foundation chain is coming out the same width as the top of the stitches. Hope this was helpful to some of you. Happy Crocheting! Previous Post Invisible Finish (fasten off) Tutorial Next Post Tips and Trics 2 – How to stop yarn from rolling everywhere.